To commemorate the 500th anniversary of the first recorded printed article in Scotland a public day of printing was held at the Visual Research Centre - University of Dundee, Dundee Contemporary Arts, Dundee. The event was based creatively on the original first ‘official’ printed document in Scotland; John Lydgates poem ‘The Complaint of the Black Knight’. This is recorded as printed on April 4th 1508 by Printers Chepman and Myllar at premises in the Cowgate, Edinburgh. 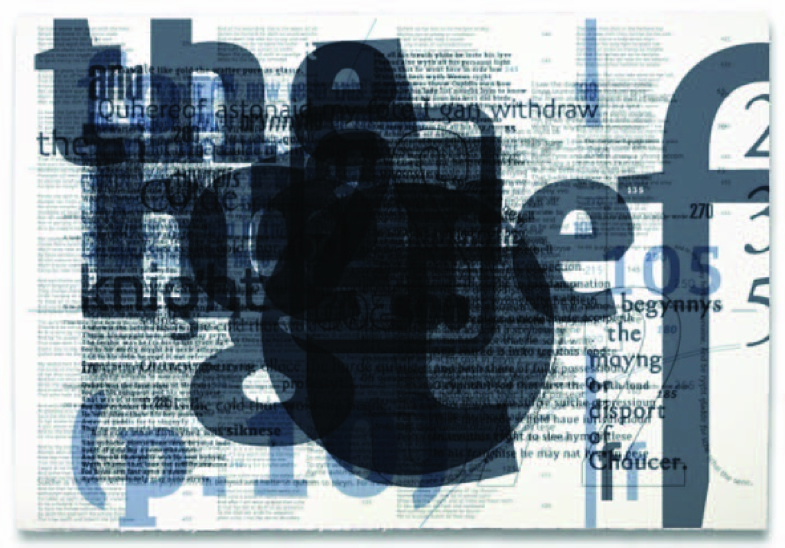 Artist printmakers Scott Hudson and Paul Harrison collaborated with Designer Andy Rice to produce a series of screenprints based on the original texts and print devices currently held in the National Library of Scotland and National Archives of Scotland. The print production took place on 4th April 2008, exactly 500 years to the day of the first recorded print edition. The print process itself was a live performance and an open invitation for a public audience to observe and engage with the production of the work. As the day progressed, a website was built and the completed pages were hung in VRC Centrespace as a site specific composition. This exhibition then formed the backdrop for the conclusion of the days printing; a public lecture by Anna Spackman, lecturer in Mediaeval Literature, and a reading from the original poem by David Robb, Professor of English Literature. Eighteen limited edition portfolios printed and selection of these portfolios will be housed in the collections of the National Library of Scotland, The National Archives of Scotland. Paul Liam Harrison is an artist with a background and prevailing interest in print, printmaking and publishing. His practice inherently combines the use of traditional print methods and materials with new and emerging technologies. He is currently appointed as researcher/research assistant at the University of Dundee, Visual Research Centre (VRC) Print Publishing facility where he recently completed his PhD – ‘Designs for Life: art, science and collaboration. A practice led study in fine art printmaking’. Scott Hudson is a graduate of Illustration and Printmaking from Duncan and Jordanstone College of Art and Design. I have been employed as a Print Instructor at Dundee Contemporary Arts (DCA) Print Studio for the last ten years. This role incorporates a number of aspects ranging from; the printmaking technical assistance on contemporary print editions and projects, the delivery of printmaking workshops and demonstrations, as well as community educational classes in the outreach programme. I’m also currently a freelance artist and as well as my own practice, I have worked on a number of collaborative print projects. The most recent being based in Trout Lake, North West Territories, Canada. With extensive experience of the Creative Industries, Andy has a deep knowledge and understanding which has been developed through working on projects with blue-chip companies, for example, Tesco, BT, Scotrail, ; Educational Institutions, for example, Edinburgh College of Art, Abertay University and the University of Dundee; Public Sector bodies; SME’s, and individual practitioners, for example, the acclaimed Scottish artist Will Maclean (Driftworks 2001), the award winning writer Bill Duncan, ‘The Haar’ (2003), Liz Ogilvie ‘Bodies of water’, (2005) and Joyce Cairns, War Tourist (2006). Just completed the 2010 exhibition design for V&A AT Dundee, 6 architects competition. All of Andy’s work is founded on a commitment to a distinctive design aesthetic, which respects the traditional while pursuing the innovative.